A customer in Blighty's Tuck Store was buying haggis recently. We struck up a conversation in which she told me she was using the haggis as a stuffing for chicken. I didn't get her name, but if you are that customer, I want to thank you for the idea. I didn't get a recipe from the customer so I set about developing my own. The dish I came up with is absolutely delicious; here is how I made it. 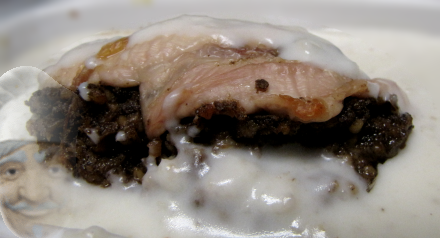 I really enjoyed this dish; the thick, creamy oatmeal sauce was a perfect complement to the rich, spicy flavour of the haggis. I used canned haggis which is convenient and which has a very traditional rich flavour that I particularly enjoy. This dish is going to be a repeat favourite in my household!